Gear up: wear heavy duty, snug-fitting clothes, boots, gloves, eye and ear protection, and a hard hat. Check your pole saw chain oil level – should be at least halfway up the chain oil window. Keep people and pets clear of your work area. Ensure your extension cord is for outdoor use and plugged in. Loop the cords so that if one gets snagged you won’t lose power. Stand in a stable position, feet apart. Hold the pole with your left hand, thumb wrapped around and arm straight. To start up, press and hold the throttle lockout and squeeze the throttle control. With the saw running at full speed, press against the wood with light, steady pressure. Don’t force it. Let the chain do the cutting. Stay in control, and never raise your arms over your head. Keep them at waist level for stability. Always stand at an angle to the limb you’re working on so you’re not under it when it falls. Press the chain oil bulb every 10 to 30 seconds while cutting to lube your bar and chain. This makes cutting easier and extends the life of your equipment. Release the throttle control as soon as you’re done, and let the saw come to a complete stop. When you’re done limbing, detach the chainsaw from the pole to turn cut limbs into firewood. Only operate during the day, when you can see. Avoid using in wet or rainy conditions. Keep your cord untangled and know where it’s at at all times. Watch out for electrical wires and any other objects besides tree limbs. Only cut one limb or branch at a time. When cutting a limb under tension, watch for spring back – when the limb is freed and springs back or down at you. Do not attempt to cut branches thicker than 8 inches – call a professional. When cutting downed limbs with your pole saw, watch out for kickback. For more on kickback, watch this. 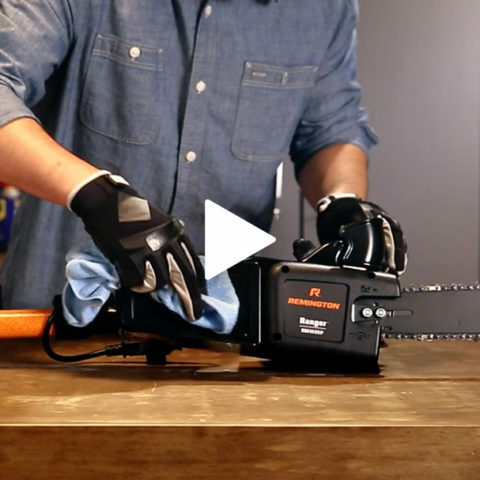 Looking for a different pole saw how-to? 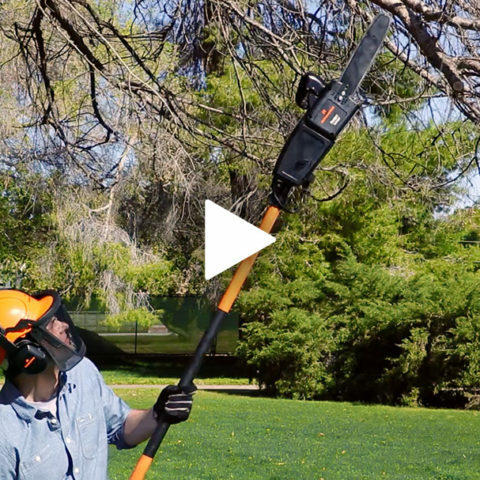 There's a right way and a wrong way to prune tall branches and limbs – it's called a pole saw.